I woke up in the night many times to the sound of loud wind blowing the tent back and forth. I opened my eyes and saw that one of the tent poles was being bent by the wind. I was too tired to care, shoved my earplugs in, and fell back asleep. We camped in a small park near Silfra, one of the best dive sites in the world. We arrived around midnight after driving for hours from the Westfjords of Iceland. The wind was rushing down through the valley from the mountains. We were both exhausted, but still happy to be there. This was our last day in Iceland. We made a standard, not-so-great breakfast of banana and granola bars, packed up the tent, and drove to the dive location. The anticipation of diving in such a unique place had me anxious. The unknown had me wondering of various possibilities. Upon arriving we drove up to the outhouses to relieve ourselves. After exiting the car, I felt a sudden rush of nerves. Needless to say, I ran to throw up my breakfast. 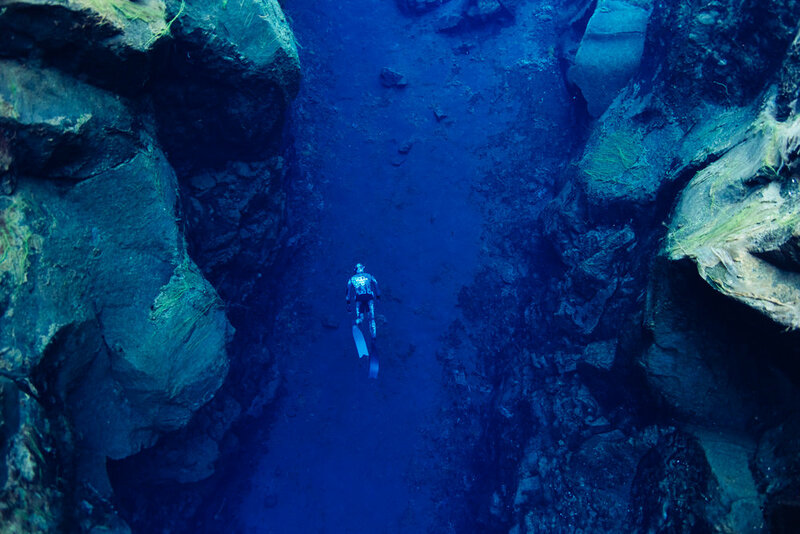 Anxiety gets to me at times… After the temporary discomfort I felt better and walked over to Birgir, the man behind Freedive Iceland. Birgir’s van was large, it looked like one of those huge Mercedes Benz vans, with big doors at the back. He came out and shook my hand. His face was weathered, middle aged, but he was in great shape. He had a large grin on his face as I introduced myself. Immediately he started cracking jokes and prepped our gear for the dive. A young couple from England arrived who were trying free diving for the first time. I was impressed, and also a little concerned. Soon after, another couple arrived a few minutes later. Both had done a little snorkelling, but not much experience. I felt like Birgir and I would be working together on this one. We geared up and walked towards the entry point to Silfra. The water temperature here hovers around 0 degrees Celsius, something I am used to. We walked down a set of steel steps to a large platform that had been installed in years past for easier entry for scuba divers and their big tanks. I got in the water, de fogged my mask, and dipped my head into a whole new world. After the initial bite of the cold water, I saw. The water was as clear as air. I could see at least 200 feet horizontally. In the distance I could see scuba divers that looked as small as my thumb. I was mesmerized by the beauty. We slowly swam through the Silfra crack, trying not to muck up the water with any neon green algae that lined the cliff walls. We reached spot where we could dive deeper. Birgir gave me the thumbs up to dive down. I handed him my camera, took a breath, and descended. Diving down like I always do, I focused on technique, equalization, and relaxation. Upon reaching the bottom around 20 meters, I looked around at the vast underwater canyon that laid before me. I felt like I was within an alien world. The green algae lined the cliffs, slowly swaying back and forth from the current. Boulders the size of cars lined part of the bottom. Time slowed down and I felt very alone in this deep pit, yet comforted by the blue hues of the water. I turned up and started to kick for the surface. The cold slowly got to me as I started feeling the shivers. On the surface Silfra appears to be a normal river winding through the Icelandic countryside. But below is an entirely distinct atmosphere. We live on an incredibly diverse planet with so many unique places. Silfra is one of those places. It was simply amazing to dive this special spot, and I hope by the grace of God I can continue to explore these wild places. Sign up with your email address to receive new posts by Geoff!